"We're trying to tell you to live your life to the fullest." Renowned hip-hop artist Kid Frost sits close to the camera and speaks directly to you about the genre for about 15 minutes. The camera does not cut away for music clips, live videos, or other speakers, and this freedom allows Frost to extensively state his feelings on the current state of the music. He addresses the problems that Latinos (including himself) have faced over the years and why they have not become even more successful. Kid Frost's sharp monologue is the highlight of Heroes of Latin Hip-Hop, but it also exemplifies the shortcomings of this heartfelt documentary. His words would have been even poignant when combined with images and music, but none exist besides the prominent interview shots. In 1990, Frost released Hispanic Causing Panic—a highly regarded album that fused his Spanish background with a modern sound. His appearance on this feature increases its relevance, but the lack of a convincing style lessens the messages presented. Quick shots from the filming of Cypress Hill's "Lowrider" video bookend the film. B-Real, Sen Dog, and DJ Muggs have been continually raising the bar for Latin hip-hop since their self-titled debut in 1991. Sen Dog takes significant time to discuss the tremendous obstacles of his younger life here and conveys a refreshing humility. I am not a big fan of Cypress Hill's recent musical output, but I do admire their down-to-earth attitude about the group's considerable success. Fans should enjoy Sen Dog's comments, which provide an inside look into his background. Of course, you could not have a discussion of Latin hip-hop without words about getting high, a frequent topic in the lyrics of Cypress Hill and others. Frost says that he needs to smoke a few joints to make music, which could explain the poor quality of his new tracks (see extras section). Luckily, the focus remains on the origins of genre pioneers like Frost and Mellow Man Ace, who lived far from luxury when he started. The material remains interesting throughout most of the production, but a lack of any original style hinders its flow. Awkward cuts bridge each conversation, and only simple titles present the speakers. One telling example is a brief appearance from superstar Busta Rhymes, who says hi to B-Real and then jokingly yells at the camera. The scene has extremely quiet sound and serves no purpose other than to show their cool connections. The overall lack of a consistent direction hinders the film and removes some weight from several compelling interviews. Image Transfer Review: Heroes of Latin Hip-Hop is a documentary of the most basic kind in terms of visual style. This lessens the need for an attractive transfer when few interesting pictures exist. However, I would expect better than the home-video quality of this presentation. The full-frame transfer appears to have no digital enhancement of any kind, and would probably look the same in a VHS version. This negative does not hinder the effect of the discussions, but it is noteworthy when rating the transfer. Audio Transfer Review: This audio track contains nothing noteworthy or even remotely impressive. The conversations remain centralized and sport a feeling of mono simplicity. Even the music from the Cypress Hill video shoot and in the background of the Kid Frost interview is very dull. As with the image transfer, I cannot imagine that a VHS version would have much difference in sound quality. The obvious budget constraints do make the problems more understandable, but only up to a certain level. Extras Review: After hearing the artists discuss their interesting histories during the feature, a musical supplement is almost essential to showcase their talent. The "Live Beats" section presents several of the pivotal groups in concert. While the energy of each act is impressive, the sound quality is utterly terrible. This lessens the impact of the music, which is very bass-heavy and muddled. Cypress Hill performs classics like "Hand on the Pump," "Real Estate," and "Rock Superstar," in 13 minutes of clips from a Las Vegas club and festival in Los Angeles. The shots do give you the feeling of being right on the stage, but it falls apart in the audio department. SX-10 is a heavier funk-metal side project for Sen Dog of Cypress Hill. He raps over fast, driving chords for about eight minutes, and the overall effect is decent. The unfortunate sound once again lessens the experience. Next comes Kid Frost, who lip syncs to some tracks playing in his studio. I understand his influence on Latin hip-hop, but these songs are pretty bad. He utilizes a nearly laugh-inducing take on the melody for Queen�s "Bohemian Rhapsody" and utters silly lines like "Big boys don�t cry, big boys get high.". Finally, we see one song from the chaotic sound of Drunk with Power, who convey little rhythm or melody. The audio quality is slightly better here, and the energy is nice, but it becomes tedious very quickly. The remaining supplements include a small collection of photos and a listing of several notable web sites. The ten pictures do each offer a caption, which offers a welcome assistance to less knowledgeable viewers. 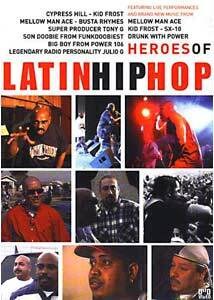 Heroes of Latin Hip-Hop takes a very straightforward look at the major Latin artists through simple interviews. It falls short in terms of presenting the actual music, but we do receive plenty of notable background about Cypress Hill, Mellow Man Ace, Kid Frost, and others. Hip-hop fanatics looking for videos and better live footage should check out more prominent DVD releases like Cypress Hill: Still Smokin'. Devout fans will probably enjoy the substance of this documentary, but it misses the boat on the musical side.